As said in former posts, once formed, fruit trees don’t really need to be pruned. However, pruning helps get bigger harvests, fruit more homogeneous in size, better distributed on the tree and more sun-ripened, among other benefits. This is what I learnt this morning at a pruning training here in France. And let’s face it, I, the amateur gardener who likes things to be quick and simple, enjoyed this training so much that I am buying into the idea of looking after my fruit trees more than I thought I would do in the first place. With a bit of practice, it shouldn’t take more than an additional hour per year to get the best from a tree anyway. But I feel I will play more often than that with my pruning shears, optimising the aesthetics and productivity of my orchard, when I have one, as it is just good time spent in the garden building rewarding future prospects. 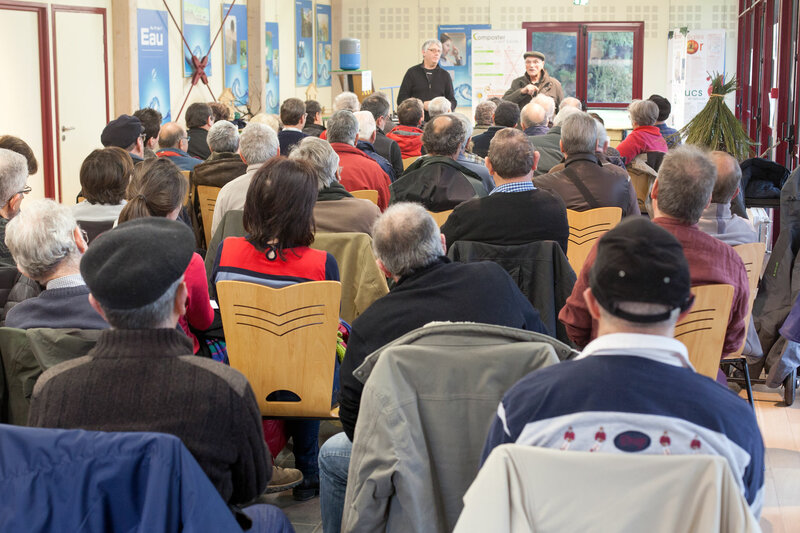 Around forty people attended the three-hour free pruning training organised by Les Croqueurs de Pommes du Cantal. Photo Aurillac, France. According to our instructor this morning, plum trees should be pruned after the harvest and cherry trees when the cherries are still on the tree. He reminded us of tree owners in small villages, who visited their neighbours to give them long branches full of sweet crunchy and juicy cherries… Yes, it rang a bell, I remembered this huge cherry tree just below our property when I was a child and the one meter long branches we were once given. Prune twice, once in winter and once in summer. 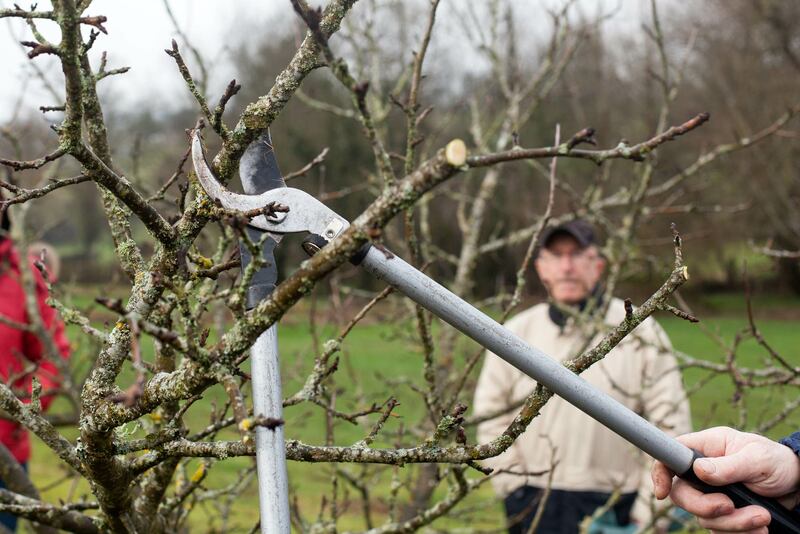 Winter pruning “ensures a good cycle of fruiting wood. Trees that are not pruned become less productive and congested with old branches” (source British Royal Horticultural Society: I couldn’t have summarized better what we were told this morning). 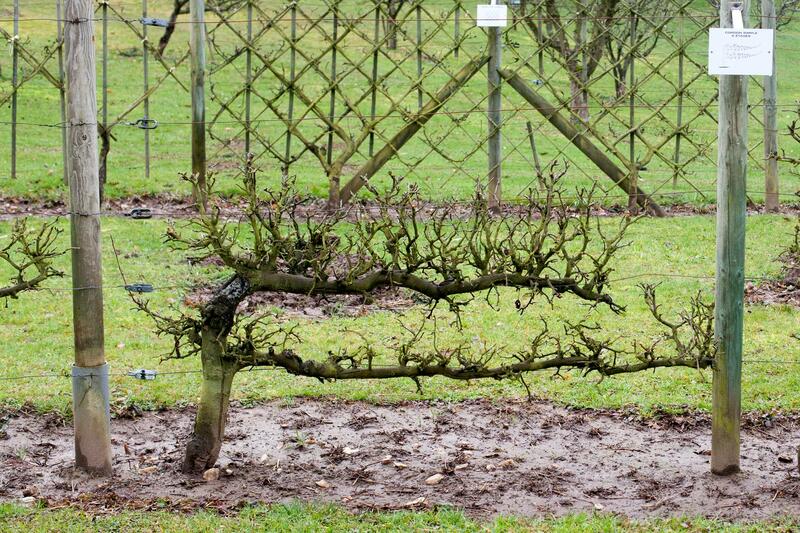 Winter pruning can be carried out from November to March. Our trainer recommended that in our 600 meters high in altitude area and the cold nights that go with them, plus humidity, pruning should definitely take place in February-March. An other advantage is that buds are bigger. The amateur gardener will spot the difference between fruit buds and wood buds more easily. 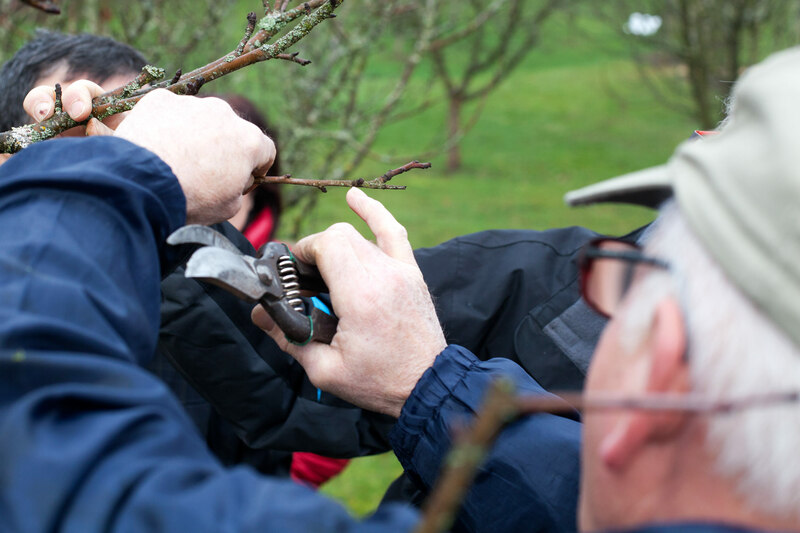 More on winter pruning and fruit and wood buds on the British Royal Horticultural Society (RHS) website. Instructor showing a fruit bud on an apple tree. In two weeks time, the difference between fruit buds and wood buds will be much easier to spot, good for the amateur gardener. Summer pruning “allows sunlight to ripen the fruit and ensures good cropping the following year” (RHS). Our instructor applies this technique not only to “trees trained as restricted forms” (RHS), but also to standard ones. It should be carried out in July-August. More on summer pruning (RHS). Bigger branches were cut on this particular apple tree to significantly reduce its size. We also learnt that trees not pruned for many years should be brought back to the desired size in three steps over a period of three years, otherwise they will produce more wood and less fruit. Cordons are one of the restricted forms presented in the orchard where we were trained today. Not for the unexperienced gardener! Just one more thing: the specialists recommended that we clean our pruning tools when going from one tree to the other, to avoid spreading diseases. It is like washing one’s hands regularly when cooking. Common sense! This entry was posted in Grow and tagged Apples, Aurillac, Cherries, CroqueursDePommes, France, Pears, Plums by Les Jardins d'ici. Bookmark the permalink.